"The season for strawberries, the most delicious of English fruits, has ended. 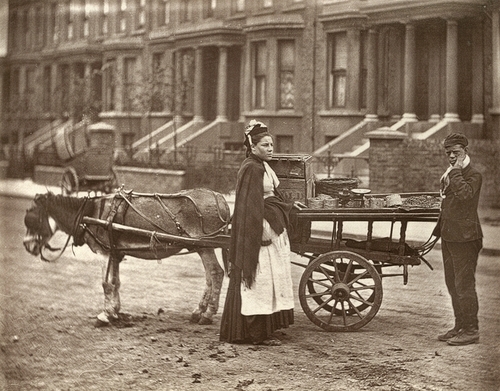 This delicacy was brought in numberless barrow- loads to the doors of the poorest inhabitants of London. The familiar cry, "Fine strawberries. All ripe! all ripe!" is silenced for a season by sounds less welcome. The fragrance of the ripe fruit wafted by the summer breeze from the coster's cart as it passed through the alleys, is replaced by less grateful odours - by the normal atmosphere of over crowded neighbourhoods, by the autumn taint of animal and vegetable decay, which invests the low-lying districts of London."